Q. Could you give us a little sense of how the courts are playing here this year. Are they a little slower than last year, perhaps? RAFAEL NADAL: No. I don't have this feeling, especially when probably the practice week, the week before, yes. But for the weather conditions, the weather was, you know, cold, humid, was cloudy all day. That makes the ball slower, and that's makes the ball much bigger. Today start the good weather. Good hot over there, and the ball went faster from the racquet. The weather makes a lot of changes on the conditions especially on the ball. Q. Was it perhaps because of the weather that you felt you needed a bit more strapping on your leg, extra protection? RAFAEL NADAL: No, that's not the reason, no? I gonna do because I think, you know, doing this band there, I don't want to create mystery or nothing. I gonna say what happened. I had a fantastic week of practice with nothing of pain, no one bad feeling on the knee and no one place on my body. So I was really, really happy with everything. But yesterday afternoon happened the more strange thing ever happen to me. I was sitting on a chair in the hotel. I felt like a crack on the knee, but is nothing really strange. Happens lot of time with articulation, movement, articulation. Nothing strange. I stand up. I felt the knee a little bit strange. I moved the leg like this two times to try to find the feeling. After the second time, the knee stays with an unbelievable pain completely straight. I really couldn't move the knee like this (indicating just a little bit). I have no movement on the knee. I have a hard afternoon. I did all the tests. Came here for ultrasound. Went to hospital for MRI. I just can say thank you very much to the tournament for all the facilities give to me on a Sunday. Not easy to find places, and they make fantastic work for me. So I just can say thanks to them. And, seriously, yesterday during the evening I wasn't hundred percent sure I would have chance to play, because with the movement of that knee I felt that I will not be able to play. I did a lot of treatment. The MRI was positive. Nothing wrong shows the MRI. So that's always a lot of calm. But still the knee, you know, with the pain. Finally what happened is with the movement, articulation, probably pinch maybe the tendon little bit or something that put the tendon completely straight. That's why yesterday we did a lot of work during the evening. At the end of the night with a lot of pain, but I finally really had the full movement of the knee. I wake up today morning with a little bit better feeling. I did all the treatment. I was all the day doing the treatment. I started the match with a little bit of scare at the beginning, and nervous because I was really disappointed yesterday. But, you know, after the first 10 games that was scare, I started to play with normal conditions. The best thing is I felt the knee very well. So is something that I really don't understand why happened everything, but I am really happy that today I was ready to play and I played a fantastic match. Q. What sort of treatment did you get on your knee? RAFAEL NADAL: Is really strange, because you can have feeling like this, because you have bad movement, aggressive movement playing. Nothing like that happened. So I did a lot of physiotherapy with my physio trying to relax everything. Antiinflammatories, a lot. Local antiinflammatories. Everything. Tried to, you know, take the pain out. Q. As usual, hard courts are a very punishing surface to play tennis. RAFAEL NADAL: But that wasn't the case. Q. I'm just saying, to play seven matches potentially on a hard court in two weeks is asking a lot, or that should be okay as long as you feel the way you feel? 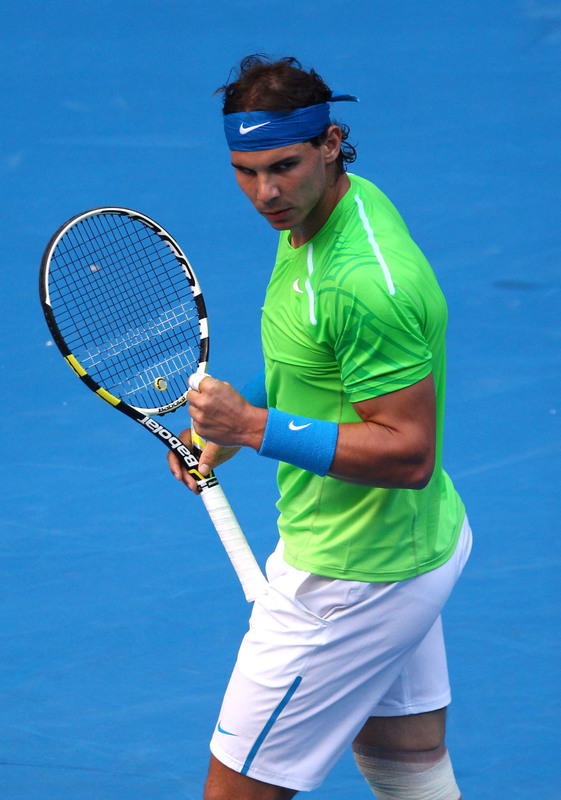 RAFAEL NADAL: Sorry, but I have good hopes. You can have an injury playing an aggressive movement. But sitting on a chair, you cannot have injury. So that's why I really keep not understand what's going on. But I understand when the knee comes back to the right place, you know, and we are able to relax that. So I was much more scared about the first match than the rest, because today now I have 48 hours to the next match. So I am really confident that having the worst feeling that I ever had in my knee yesterday and today was able to play. I have fantastic hope that gonna happen the same for after tomorrow. Q. Have you had a chance to speak to Roger, following your comments yesterday, regarding the problems on the tour? RAFAEL NADAL: No. But, anyway, probably yesterday what I said I said. Probably I am wrong telling that to you, especially because these things can stay, must stay in the locker room. I always had fantastic relationship with Roger. I still have fantastic relationship with Roger. That's what should be, in my opinion. Don't create crazy histories about what I said yesterday, please. Just I said, because, you know, we can have different views about how the tour need to work. That's all. Q. Did the top four players get together on Sunday after the players' meeting on Saturday? Q. Do you plan to speak to Roger soon to try to explain what you meant yesterday, maybe to apologize? RAFAEL NADAL: No. You know, what I said I said. I feel sorry for say that, especially to you. Because when I say that, I have to say him personally. But that's it. Forget. I do not talk anymore. During the two weeks, you can try very hard to asking me a lot of things. Yesterday, you know, I started, and I say I don't want to talk anymore about this. Finally I talked to much as usual. That's not gonna happen again. I advise all of you. You can try hard, but I gonna talk about tennis. If I am here two weeks, if I am here two days, I gonna have less work. THE MODERATOR: Any more questions? RAFAEL NADAL: After that... You are only interested in that, not the tennis (smiling).